The evergreen holly tree is one of the four flowers we traditionally use during the celebration of Christmas in France. It was also one of the plants our Celtic ancestors used during the Winter Solstice celebrations. It was indeed seen as the symbol of death and rebirth of the Sun as sunlight decreases until the solstice then starts to increase afterward. They associated it with the Sacred Oak, which they considered as the Holy King of the Trees because of its longevity, size and its nutritious acorns. They believed that the deciduous Sacred Oak and the evergreen Holly Tree were twins. They believed that the latter was the incarnation of the Sacred Oak Tree during winter, once it had shed all its leaves. They also thought that its red berries brought beauty to the dull and short days. However, came the Summer Solstice, the thick foliage of the oak tree overshadowed the Holly Tree. The Holly King would therefore be King in Winter Solstice, and the Oak in Summer. The Romans used it during their Saturnalia. They also held these celebrations dedicated to Saturn, their God of Harvest and Fecundity, over the Winter Solstice. This was the time when they exchanged wreaths of holly adorned with representations of their god. The first Christians adopted the evergreen plant for Christmas. They indeed complied to Roman traditions and adorned their homes with wreaths in order to avoid persecution, while secretly celebrating Jesus’ Nativity. They saw in its prickly leaves the symbol of Jesus’ Crown of Thorn, while the red berries symbolized Jesus’ Blood and the evergreen leaves Eternal Life. Most of this overwhelming symbolism has however disappeared, and it makes our celebrations more spontaneous. In fact most French use it because their parents and grand-parents did before them. 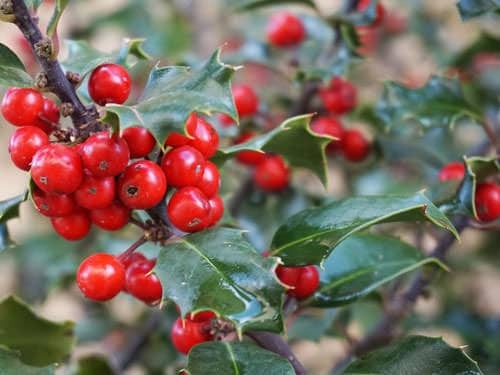 However, most use holly because it is an attractive and colourful plant and one of the very few to bear fruits in winter. They also make a wide use of variegated hybrids with no prickly leaves as they contribute to splendid decorative effects! 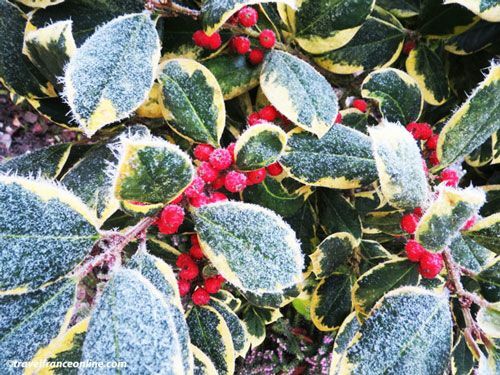 The three other Christmas plants traditionally used are the poinsettia, ivy and mistletoe.